The first part of this grand hall was built sometime after 1576 by the Charnock family, when their original home in nearby Charnock Richard burnt down. Astley Hall today contains Tudor, Stuart and Georgian architecture that reflects the times and building tastes of the three families that owned it throughout most of its history. Robert Charnock constructed a typical Tudor timber framed grand house, built around a central courtyard. Tudor parts of the house that can still be viewed today include the Great Hall, the ‘Cromwell Room’, the Stucco room and parts of the central courtyard. Much of the building of the Tudor part took place in the reign of Elizabeth I, and with a Protestant queen on the throne it was a difficult time for local Catholics. Some would have worshipped in private and had a priest secretly conduct mass for them. Many old halls in Lancashire would have somewhere to hide a visiting priest. The Stucco room contains a priest hole to the right of the fire place. This is very similar to one found at Speke Hall, and perhaps not coincidently Robert Charnock’s first wife Isobel Norris came from there. During the Civil War many Catholic families sided with King Charles I, and the Charnocks did likewise. A portrait of a later Robert, ‘Captain One-Eye’ Charnock hangs in the hall today. He is said to have lost an eye during the war. The incident occurred during the siege of Lathom House near Ormskirk, while he was defending it against the Parliamentary army. His estates were confiscated for his actions and he had to pay a £260 fine to have them returned to him. 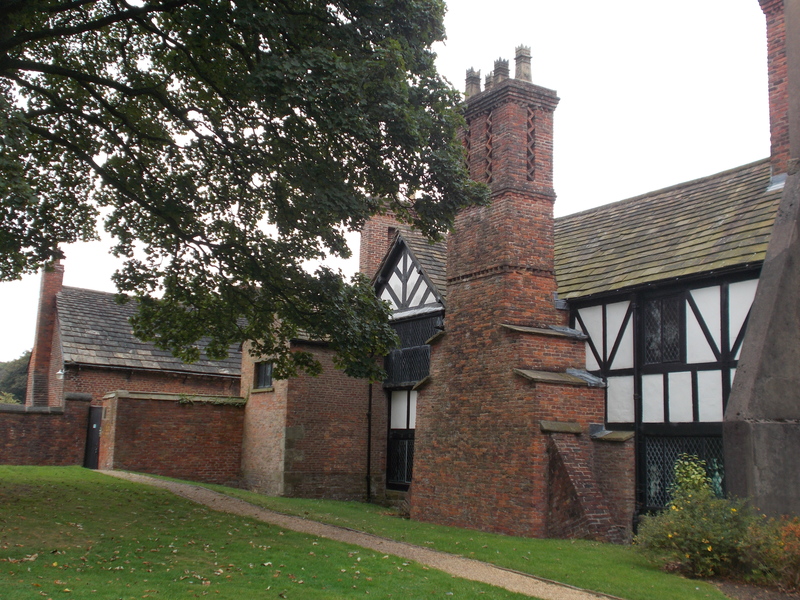 A second connection for Astley Hall and the Civil War in Lancashire is the visit of Oliver Cromwell, but this could just be local folklore. A lot of the older buildings in Lancashire seem to claim that Cromwell slept in them. He was in fact only in Lancashire for a short time before he led the last decisive battle of the Civil War, at Preston. Astley Hall has a Cromwell Room where he supposedly stayed, a Cromwell bed which he slept in (now in the Oak Room), and even a pair of his boots ! Robert (Captain One-Eye) was the last of the male Charnocks, so the house passed to his daughter Margaret. In 1665 she married thirteen year old Richard Brooke who moved with his father to live at Astley. It is the Brooke family that is responsible for changes to the house, and with the austerity of Oliver Cromwell’s rule behind them, and the merry monarch King Charles II on the throne, perhaps they wanted a more modern feel. The highly decorated plaster ceilings in the Great Hall and Drawing Room were created then, probably to celebrate the marriage. They consist of a huge amount of decorative plants (‘ornate foliage’) and large cherub like figures (‘cupids’). The shapes were made from wood and leather, fixed to the ceiling and then the plaster would be added over the framework. More plaster work from this period can be seen in the Stucco and Morning rooms. The Brookes also added the present day front of the house, which features large imposing bay windows. The grey plaster work was added later, but underneath it is red brick. In 1787 the Townley Parker family took over Astley Hall. They had the surrounding parkland landscaped, a walled garden created and a coach house built. The garden and coach house have recently been renovated and both can be visited today. They built the east wing of the house, which is the side that overlooks the lake. The outside of this wing is covered in plaster to give it a stone-like appearance. The brickwork of the front of the house was probably also covered over with grey plaster then, giving it the look we see today. The Dining and Inlaid rooms were created, in which different coloured woods are used to produce distinctive paneled patterns. The panels of famous historical figures were added to the Great Hall, harking back to the building’s Tudor past. In 1922 the final family to own Astley, the Tattons, donated both hall and grounds to the people of Chorley. Chorley Corporation converted three of the rooms to an art gallery, and then opened Astley Hall up to the public. The art gallery is still open today, as are most of the many rooms in the hall. This blog post cannot do justice to the sheer variety of rooms and artefacts on display, as only a visit can do this. The hall is completely free to visit, for anyone, thanks to the local council and the people of Chorley. 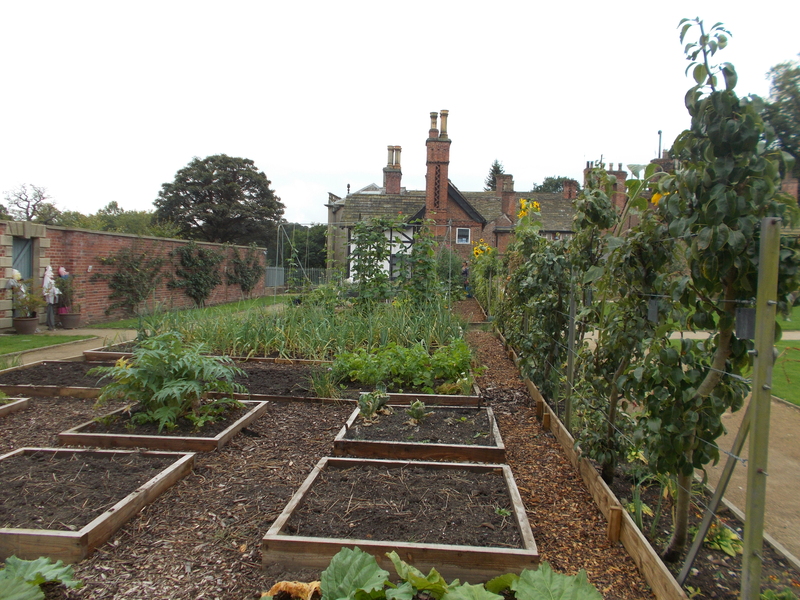 The walled garden has recently been renovated and replanted and is now open to the public for the first time in many years. The Georgian coach house, a huge grade II listed building, now houses a café and exhibition centre. There is currently a large display on the Chorley Pals and World War I on show there.